Heat oil on a stove (while grating carrots). 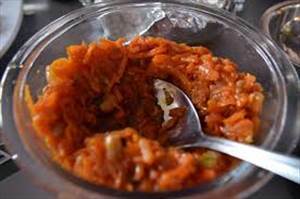 Once oil is heated, saute the grated carrot until soft. Add baked beans and continue to cook for no more than 3 minutes. Add a dash of peri-peri sauce and remove from heat. Brown rice, corn and red kidney bean salad with creamy avocado. There are 231 calories in 1 serving of Chakalaka. Calorie Breakdown: 57% fat, 36% carbs, 8% prot.